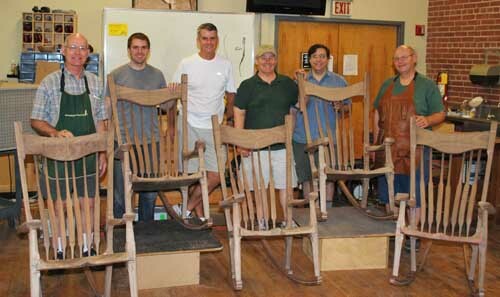 In early August, five hopeful woodworkers traveled to Highland Woodworking to make their Maloof Inspired Rocker with master chairmaker Charles Brock and his assistant Mark McGowan. They all came from different places but interest in learning new skills and building the rocker was their common reason for attending. A retired shop teacher/school administrator from California came to build a rocker for his first granddaughter and a young man from a nearby Atlanta neighborhood came to build a rocker for their first baby coming in December. They spent seven days learning to sculpt the contours of a coopered seat; bending laminations on a glue form for rockers; cutting all the joinery using the SawStop table saw and fitting them precisely with hand tools and patience; band sawing and shaping all the parts with rasps and scrapers; and preparing the chair for fine finishing in their own shop back home. Their woodworking will never be the same after the intensive experience. Check out the great slideshow from the class!